Enroute to Bella Coola, we’d planned only to stop overnight at the Vagabond Resort and RV Park in Nimpo Lake, but it turned out to be the best part of our vacation. Pulling into our campsite right on the lake, I knew I was home. I’ve always defined my perfect spot or ‘home’ as a super-quiet spot on a northern lake with a Beaver at the dock and loons calling out all around. Granted, my imagination called for a Turbo Beaver on amphibious floats, but at this stage of life, I’m not going to start quibbling. 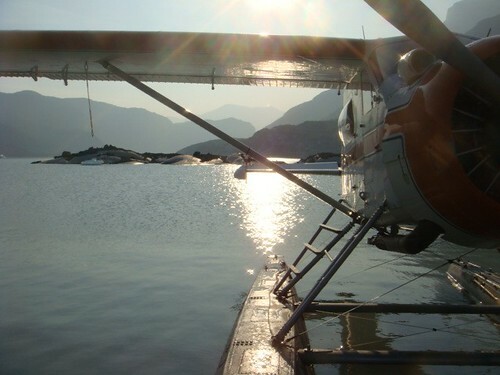 After seeing pictures of Sid (the owner of Lakes District Air Services Ltd.) standing beside the Beaver on a glacial lake, I KNEW that was exactly what I wanted to do — fly out to a remote glacial lake, land and revel in the splendour of a glacier in complete solitude for even just a short while. So, we planned our flight into Jacobson Lake for departure at 7AM the following morning, along with a overflight of Hunlen Falls and the Rainbow Range in Tweedsmuir. Sid is a REAL pilot and I’ve flown with enough pilots (100’s) to know the difference. I add him to my list of 2… Damon Lapalme and Lois Aylen. So, now there are 3. I could write a complete article on what makes a REAL pilot, but let’s just say that it’s a feeling… a seat of your pants thing… always on the ball — meaning that the ball is always in the middle – no unnecessary yawing, pitching or rolling… just beautiful airmanship. It’s one of those things you have to experience to really appreciate… kind of like a REAL sailor. 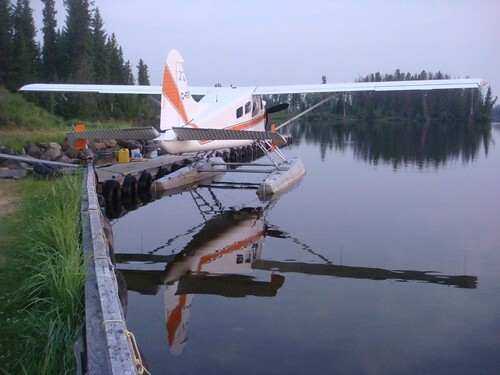 Anyway… C-FBPB is a 1960 Beaver modified with shorter pontoons. With a radial engine, she takes a little coaxing to get all those cylinders firing. Sid did so persistently yet gently… exactly as the old girl wished. 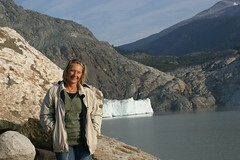 Warmed up sufficiently, we lifted off Nimpo Lake and headed southwest towards the icefields. Smoke from the fires near Dog Creek and Alkali Lake had moved in overnight and the view wasn’t exactly crystal clear, but it was beautiful none-the-less. It was a thrill to fly over Chris Czajkowski’s place at Nuk Tessli, located at the south end of Banana Lake. I’ve read meany of Chris’s books, including Diary of a Wilderness Dweller accounts of the 2 cabins she built alone beside the high-altitude lake just east of the southern tip of the Tweedsmuir Provincial Park. After viewing the glaciers, we started our approach into Jacobson Lake. OK, for Ed and I it was a bit harrowing. 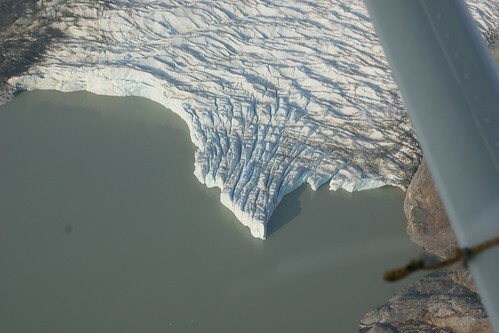 From the air, it looked like the lake was way too small to land on and that the toe of the glacier was approaching WAY too fast to be safe. Not only that, but the water is so murky with glacial till that it was impossible to know if there were obstacles just beneath the surface. Sometimes, a little knowledge (20 years as an air traffic controller) can be more detrimental than helpful and we landed without incident. How amazing. Standing there on ice-worn rocks in the midst of a wilderness very few people have had the chance to visit. Absolutely priceless. We hung out there for a bit then departed the lake for a flight over Hunlen Falls and the Rainbow Range in Tweedsmuir Provincial Park – the latter of which I’ve wanted to see forever. It was OK, but nothing compared to landing on that lake. The accompanying video gives you a 13-minute taste of what we enjoyed for 2.5 hours that morning. Oh man, I am soooo jealous! Next year I’ll be there with you!